I borrowed this one from my friend Writer2B. 1. Do you remember how you developed a love for reading? When my parents came to school I cringed when I saw that teacher coming over to talk to them. I was sure I was going to be outed as a miscreant who read books in class, but all she said was, "I really appreciate parents who know how to give good books to their children." Now I try to be that kind of parent. 2. What are some books you read as a child? 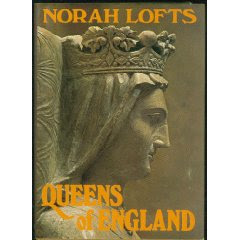 The first book I read, according to family lore, was The Funny Little Book. 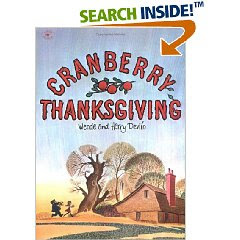 I didn't realize until I Googled it just now that this book was written by Johnny Gruelle, of Raggedy Ann and Andy fame. I loved the Narnia books from an early age, and I remember reading The Voyage of the Dawn Treader when I was seven years old. I'm pretty sure this is the first one of the series that I read. I went on to read them all many times, including one time through the whole series read aloud during family car trips. I had a wonderful second grade teacher who didn't make me work through the readers everyone else was doing - I could pick whatever I wanted. How glorious! All I had to do was read aloud to her every once in a while so that she would be sure I was making progress. That teacher read Charlie and the Chocolate Factory and Charlie and the Great Glass Elevator aloud to us that year, as well as, I think, some of the Paddington books. I know I read all the Danny Dunn books because I remember a teacher looking askance at this choice when I was in about fifth grade. Oh, there are too many to list. I read voraciously. I remember Saturday afternoons in the library at boarding school - completely unsupervised and completely happy. 3. What is your favorite genre? Hmm, it's hard to say. I mostly read novels, and I like a pretty wide variety of those. I do enjoy anything with cross-cultural implications - from Henry James to Jhumpa Lahiri. I don't know that there's a name for that genre. 4. Do you have a favorite novel? Again, it's so hard to pick just one. I have read many that I consider just about perfect. Some of them are The Peacock Spring by Rumer Godden, July's People, by Nadine Gordimer, A Room With a View, by E. M. Forster, Far From the Madding Crowd, by Thomas Hardy, The Game, by A. S. Byatt, The Great Divorce, by C. S. Lewis, and The Giver, by Lois Lowry. To name a few. 5. Where do you usually read? I read in bed a lot these days, but I try to carry a book with me anytime I am likely to be waiting, so that I can use that time reading. I can read pretty much anywhere, including in a moving car, provided someone else is driving. 6. When do you usually read? I always read before I go to sleep. Even when I was in graduate school and had an inhuman amount of have-to reading, I always had something I was reading for pleasure and I spend at least a few minutes on that before going to sleep. But I read any other time I can, too. 7. Do you usually have more than one book you are reading at a time? Sometimes - it depends. I often have a professional book going at the same time as a novel. 8. Do you read nonfiction in a different way or place than you read fiction? 9. Do you buy most of the books you read, or borrow them, or check them out of the library? Some of each. I am trying to buy fewer books. I have an addiction. Whenever we go over to someone's house I always search their shelves and ask to borrow books. I use libraries as much as possible. 10. Do you keep most of the books you buy? If not, what do you do with them? I'm trying to keep fewer books, just as I'm trying to buy fewer. If I don't think I will reread it, I try to pass it on. I still have an alarming amount of books. Sometimes I will donate them to the library I go to. If they are appropriate for my students I put them in my classroom library. I've always wanted to try that thing where you leave books in public places for others to take, but I haven't ever done it. 11. If you have children, what are some of the favorite books you have shared with them? Were they some of the same ones you read as a child? This is one of the great joys of having children. I've been able to read many, many of my favorites to them. They have some of the books I had as a child, which, when you consider how many times we moved, is pretty amazing. 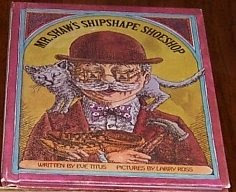 It has been fun sharing books like Mr. Shaw's Shipshape Shoe Shop and Cranberry Thanksgiving. 12. What are you reading now? Black Ships, by Jo Graham. Checked it out of the library. It's a novel about the Aeneid. I'm enjoying it so far. 13. Do you keep a TBR (to be read) list? Yes and no. I have a Wish List at Amazon that kind of functions that way. If I read about a book that sounds interesting, I put it on the list. But often I just pick up something that catches my eye. I have a stack from the library: The Wild Girls, by Pat Murphy, Going Going, by Naomi Shihab Nye, Mara's Stories, by Gary Schmidt, Unaccustomed Earth, by Jhumpa Lahiri, When We Were Saints, by Han Nolan, First Boy, by Gary Schmidt, and Due Preparations for the Plague, by Janette Turner Hospital. Some of these I'm checking out as possible read-alouds for my class, some I looked for, some just caught my eye. I love the library! 15. What books would you like to reread? I reread all the ones I mentioned in number four. I reread the Narnia series every year or so. Others I have frequently reread are Dislocations by Janette Turner Hospital (a book of short stories which appears to be out of print and perhaps even unavailable) and Home Life, by Suzanne Fox, a book of essays about the idea of home and rooms - I don't know why but for some reason I just love this book. And of course I keep rereading the Bible. But you asked what I would LIKE to reread. Hmm. I don't know. Lots of books, I guess. 16. Who are your favorite authors? Some of the ones I've already mentioned. I like most of A. S. Byatt's books, though they seem to be getting increasingly difficult and obscure. I love C. S. Lewis, Nadine Gordimer, Susan Howatch, Thomas Hardy, Jhumpa Lahiri, Edwige Danticat, Naomi Shihab Nye, Pablo Neruda, Billy Collins...there really are too many to list. This meme was fun to do. Any compulsive readers out there, why don't you answer these questions, too? Let me know when you do! 1. My 7-year-old is reading 'Dawn Treader' now too, though it's usually along with the audiobook. I'm thrilled that she feels compelled to get the book out! 2. My second grade teacher read the 'Charlie' books too. 3. "I have an addiction." Uh-oh. Now you're sounding like our favorite English professor with his ongoing struggle against buying too many books! Of all the addictions there are to choose from, I think this one's great... Unless you get to where you spend too much on books to put food on the table! I live with my family in Haiti (I used to call it Tecwil = The Country Where I Live in an attempt to preserve my anonymity and that of my adopted country - the earthquake changed that and everything else). I teach English to seventh and eighth graders at an international Christian school. The name of my blog comes from this song. Where in the world are the de Blaeij's? Stuff I Love in the U.S.